This is one pic that nearly made me cry.. My camera just couldn't get what I wanted.. grrr.. this pic is nothing compared to what I was seeing..
Wow, very cool lines and geometry. Graduated colors work extremely well. OMG, look at those chemtrails! Those lines are not natural. The photo is good though, and the idea you had in your head is exactly what I'm thinking too, this would make a good poster. I would be happy with this. Like trying to capture for all eternity a beautiful sound with a camera - difficult. this is really very beautiful, i like the dreamy look that the blur gives. It may not have come out like you wanted, but it came out well. The blur of the birds, to me, adds life to the shot. 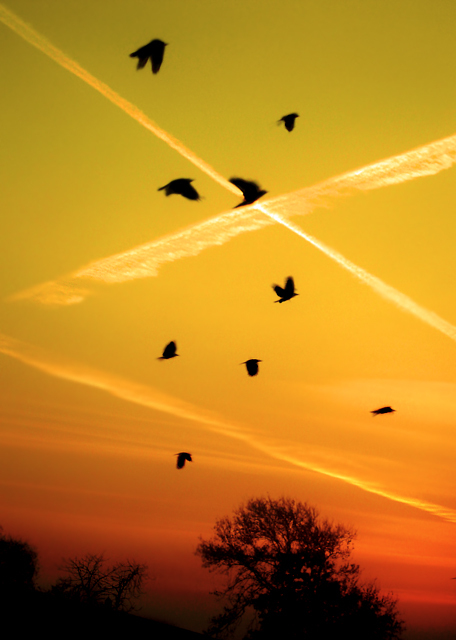 With the title and the contrails, it's a lovely piece! im not sure if i've ever seen anything more perfect. what a PRETTY photo! I think it turned out beautifully! I love the motion shown by the blur in the birds against that killer sunset! It gives it such an ethereal look. don't worry about equipment, it takes a great eye and quick relfexes to get shots like these :) nice capture! I understand what you mean about not being able to take what you're seeing, very frustrating, but for wwat it's worth, the shot is beautiful and I can picture the birds being sharper and it's great! I like the concept of this picture. It would be nice if the birds were a little sharper but under low light thats going to be tough I guess. I like the jet trails in the sky. It creates a nice pattern in the sky as well as great leading lines to take the eye around the shot. The title ties it all together really nicely. Proudly hosted by Sargasso Networks. Current Server Time: 04/24/2019 06:31:55 AM EDT.